Niall Horan and Katy Perry. One Directioner Niall Horan wrapped up a busy year last week with the end of his band’s world tour in Japan . . . and a new “bride” in Katy Perry. Katy’s beau John Mayer hopefully has a sense of humor, because the flirtation exists on Twitter only. 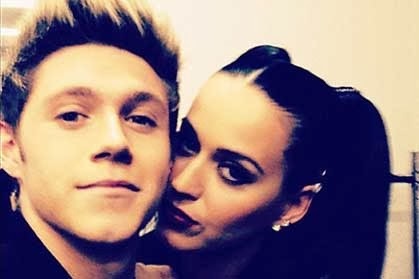 Niall popped the question to Katy – and his more than 15 million followers – on October 20, but we won’t be holding our breath for wedding bells. The 20-year-old is due back home in Co. Westmeath this weekend for his nephew and godson Theo's christening. Security will be on high alert for the arrival of the star, but he’s not expected to stay for more than 24 hours before returning to London to promote One Direction’s new CD.